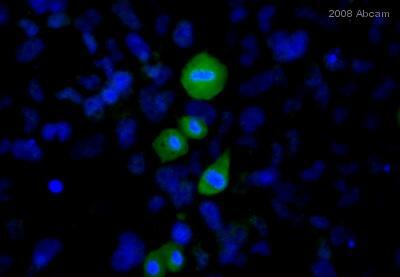 This antibody detects endogenous levels of Lamin A + C only when phosphorylated at serine 392. Synthetic phosphopeptide derived from human Lamin A + C around the phosphorylation site of serine 392. The antibody was affinity-purified from rabbit antiserum by affinity chromatography using epitope-specific phosphopeptide. The antibody against non-phosphopeptide was removed by chromatography using non phosphopeptide corresponding to the phosphorylation site. Our Abpromise guarantee covers the use of ab58528 in the following tested applications. WB 1/500 - 1/1000. Detects a band of approximately 75 kDa (predicted molecular weight: 74 kDa). Western blot analysis of HeLa cells labeling Lamin A + C (phospho S392) with ab58528. The lane on the right is blocked with the phospho peptide. Western blot analysis of HeLa cells labelling Lamin A + C (phosphor S392) with ab58528 at 1:1000 dilution. Immunohistochemistry (Formalin/PFA-fixed paraffin-embedded sections) analysis of human breast carcinoma tissue labeling Lamin A + C (phospho S392) with ab58528. The image on the right is blocked with the phospho peptide. Immunohistochemistry (Formalin/PFA-fixed paraffin-embedded sections) analysis of human breast carcinoma tissue labelling Lamin A + C (phosphor S392) with ab58528 at 1:100 dilution. Publishing research using ab58528? Please let us know so that we can cite the reference in this datasheet.